PIR sensors are widely used in motion detecting devices. 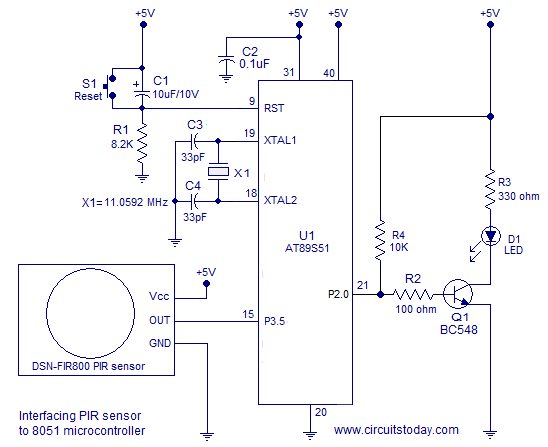 This article is about interfacing a PIR sensor to 8051 microcontroller. A practical intruder alarm system using PIR sensor and 8051 microcontroller is also included at the end of this article. Before going in to the core of the article, let’s have a look at the PIR sensor and its working. This entry was posted on Wednesday, May 13th, 2015 at 1:48 pm	and is filed under Interface, sensors. You can follow any responses to this entry through the RSS 2.0 feed. You can skip to the end and leave a response. Pinging is currently not allowed. I have a feeling english is not his/her first language. As for R4, I wonder if they got confused about which ports were open drain. From the it looks like port 0 is an 8-bit open drain port but they used port 2 which has internal pull-ups. So they were either confused or it was a carry over from when they possibly had the output hooked up to port 0. Well, I just failed at using the href tag so let’s try again. I have a feeling english is not his/her first language. As for R4, I wonder if they got confused about which ports were open drain. From the datasheet it looks like port 0 is an 8-bit open drain port but they used port 2 which has internal pull-ups. So they were either confused or it was a carry over from when they possibly had the output hooked up to port 0. Lots of care taken to create a specially boring circuit – and takes some skill to create this level of sleep-worthy article. And useful code, written in assembly so portable. All round a great project.